Killian grew up in Dublin and originally studied Science in Trinity College Dublin. He spent a number of years working in Information Technology in Ireland and abroad before making the decision to study medicine. He moved to London and trained at St Georges University, graduating as a doctor in 2010. He remained in London for an additional year gained experience in Vascular Surgery, General Medicine and Medicine for the Elderly. He returned to Dublin in 2011 and worked in St Vincent’s and Temple Street hospitals gaining experience in Emergency Medicine and Paediatrics. Killian commenced his vocational General Practice training with the North Dublin City GP Specialist Training Programme in 2012. He worked in a number hospitals gaining experience in Paediatrics, Palliative Care, Psychiatry, and Obstetrics and Gynaecology. 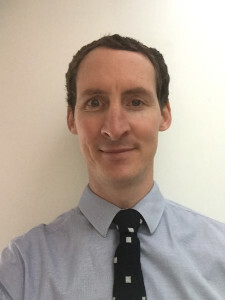 Following completion of his training in 2016, Killian has been working as a general practitioner in Dublin before joining Dun Laoghaire Surgery in 2017. He lives in Dublin with his wife and two daughters. He enjoys cycling, cooking and all things BBQ.